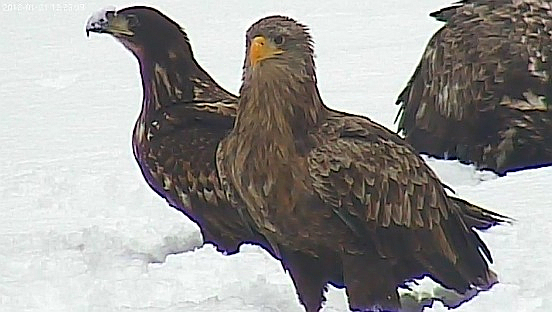 Side by side - adult and juvenile. It was a beautiful snowy eagle day at Nõva, and a beautiful skiing day at Otepää. Before midday six eagles were there at the same time in camera view. Young birds. dominated. No one was starving, and romping-wading in the loose snow that had fallen overnight lasted the whole day. There are fewer ravens this year and the crows try to tease the eagles by pulling their tails. Browsing the forum will give you the best overview of all that happened today.